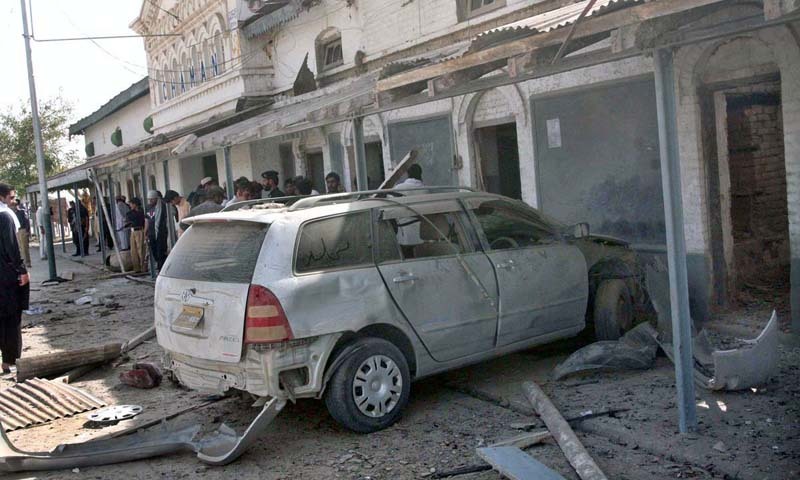 Islam Around Us: Blast near railway station in Chaman kills two, injures 15. Blast near railway station in Chaman kills two, injures 15. CHAMAN | 21 Aug 2013 :: A blast occurred near the railway station in Balochistan's Chaman town situated near the Pak-Afghan border on Wednesday killing at least two persons and injuring ten others, DawnNews reported. Security and rescue teams reached the blast site and shifted the wounded, which included women, children and two policemen, to Civil Hospital Chaman where an emergency was imposed. Deputy Commissioner of Chaman said that the remotely-detonated explosives were planted on a motorcycle whch was parked near the ticket booth at the railway station. Security forces cordoned off the railway station after the blast. Six die in Afghanistan suicide attack. Indian army kills five near Kashmir border. Iraq market car bomb kills 16. Fears Growing as Syrians Wait for U.S. Attack. Iraq officials: 2 vehicle bomb blasts kill 23. Missile strikes may lead to terror attacks on UK. Three BSF men killed in Naxal attack in Odisha. Suicide bombing in park, attacks kill 32 in Iraq. Reports: Syria chemical attack responders die. Twin blasts kill 29 in Lebanese city of Tripoli. 36 Muslim Brotherhood members die in Egypt. Pak opens fire on Indian posts in Ladakh. Lebanon arrests three for planning car bombing. Egypt: Militants Kill 24 Army Troops In Ambush. Army foils infiltration bid along LoC in Kupwara. 3 jawans, civilian injured in Pak firing. Egypt's carnage kills 578 as crisis deepens. Car Bomb in Lebanon Kills at Least 22. Pakistan accuses India of attack on border posts. Curfews Imposed in Indian-Held Kashmir. Arms Shipments Seen From Sudan to Syria Rebels. Leader of Al-Qaida Yemen Vows To Free Prisoners. Fireworks kill 17-year-old Afghan boy in Saudi. Muslim, Hindu Gangs Riot in Kashmir. Egypt army says 60 militants in Sinai killed. Syrian rebels seize arms depot near Damascus. Interpol links recent prison breaks to al-Qaeda.